Herceg Novi's 'novi', means 'new', but just because it's one of the newer towns on this beautiful bay, it was still founded in the 15th Century, so its Old Town, set on a steep hill, is an impressive mix of sunny squares, winding streets, imposing fortresses and pretty churches. 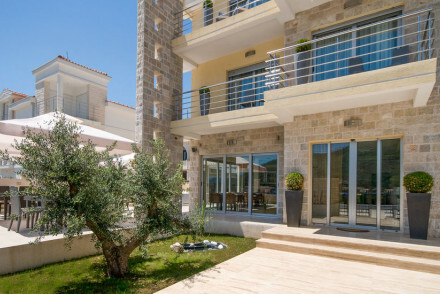 Some of the best places to stay in Herceg Novi can also be found here. It's said that the old town's architecture is similar to Dubrovnik, which is about 40 minutes away by car, but without the rows of tourists lining up to have their photos taken against it. Herceg Novi has gradually spread and engulfed a couple of the other smaller bay towns including Igalo with its famous mineral springs. You can see why it's so popular - what with its perfect spot on the mouth of the bay where the waters seem crystal clear. Take a stroll around the narrow, historic streets of the old town and admire the beautiful old architecture - alternatively, sit in one of the little cafes - great for people watching. Enjoy a boat trip to the Blue Grotto, an enchanting blue water cave where visitors can take a refreshing swim through the ancient hole in the rocks. Pay a visit to Monastery Savina, a beautiful old monastery with a vineyard - you can even sample and buy the wine they produce. Visit the Mamula Fortress located on a small island reachable by boat. This old fortress and prison has been left as it was when the troops and prisoners departed. The views are also quite spectacular. Relax at Dobrec Beach, a secluded little cove that can only be accessed by boat. There is a restaurant where you can enjoy a meal with a fantastic view. As with Kotor, the best places to stay in Herceg Novi get very busy during the summer months. So if you want to be sure of a great hotel, get organised and book early. The Boutique Hotel Casa del mare is a new hotel with its own private beach right on the bay. Modern sandstone on the outside, this hotel has large, light and luxurious interiors and just eight rooms. If you'd prefer your own space, don't hesitate to visit our online partner Booking.com for a great selection of properties along the coast or in the town. Fly to Dubrovnik Airport situated 28km (17 miles) north of Herceg Novi. The airport is served by a range of both domestic and International carriers. There are regular bus services to Herceg Novi from Dubrovnik and other destinations. Best time to visit - the peak summer months of July and August can get very hot so visitors may be better visiting just either side of these months for slightly cooler temperatures, and less crowded beaches. A newly built hotel with its own private beach on the bay of Herceg Novi. An attractive sandstone building with contemporary chic interiors. Big bright spacious rooms with all the mod cons and balconies. Fantastic beach and sun deck area. Ideal for couples, families, or a small wedding. Beach Life - Private beach with sun loungers and day beds. Sights nearby - Sveti Stefan, Cetinje, Perast. On the beach - The hotel has its own beach.